Dehydrated water kefir grains are live grains that have been dried and put into hibernation. Water kefir made with these crystals is no different than a solution made with the live grains. 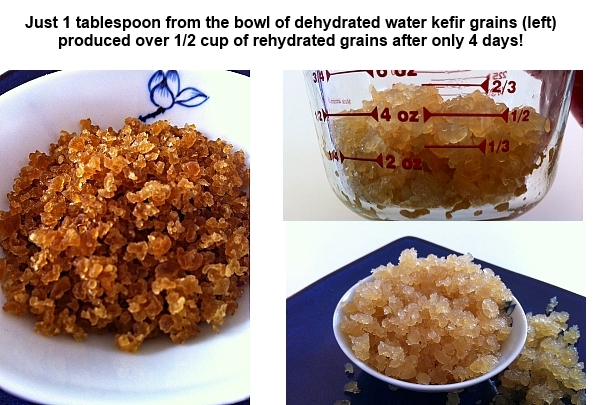 If you live in the United States, or if you live in Canada and order water kefir grains that are dehydrated, you will receive 1 tablespoon of grains. Once fully hydrated you will have a minimum of 3 tablespoons of grains. In Canada you can choose to order kefir grains that are identified as "LIVE" or "DEHYDRATED". I actually prefer to send the dried grains. Then there is no worry if they take a little longer than expected to be delivered or if there are extremes in temperature in summer or winter. If you are interested in learning how to awaken the crystals to make delicious water kefir, please visit the following link for Instructions for Rehydrating Dehydrated Kefir Grains. There you will find everything you need to know. Please do not hesitate to ask questions. Please tell me what health benefits I can expect from water kefir. THX! Hi Marni Just poke around the site. There’s a ton of info here! Do you have a vegan starter? Hi David Water Kefir grains are suitable for vegans. I live in Fort Mcmurray and want to order and get started making kefir right away which do you suggest I order? Hi Lisa Water kefir is often a good choice for first time kefir makers, as it has a sweetish taste somewhat like gingerale. Milk kefir is more sour and yeasty than yogurt. It really is a personal preference though. Winter is a good time to ship live grains. Freezing doesn’t hurt them and we don’t have to worry about them getting too warm during transport.